I’ve been trying to eat less grains these days, so I have been experimenting with almond flour. The almond flour I purchased at Bulk Barn is more a meal consistency which works for a cookie but may not translate for other baking needs. I haven’t found almond flour that resembles regular flour yet. It is on the expensive side for flours but worth it for the occasional treat. 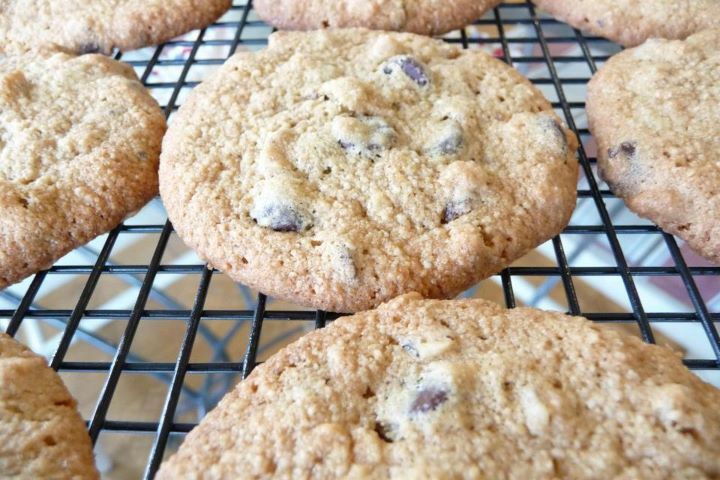 The cookies have a coconuty texture and they taste really good. Preheat oven to 350 degrees. Line a baking sheet with parchment paper; set aside. Using an electric mixer, mix together the butter, sugar in a large bowl until very creamy (like frosting). Add the vanilla and egg, mixing until well incorporated. Mix in the baking soda and salt. Then slowly mix in the blanched almond flour, 1/2 cup at a time, until well blended. 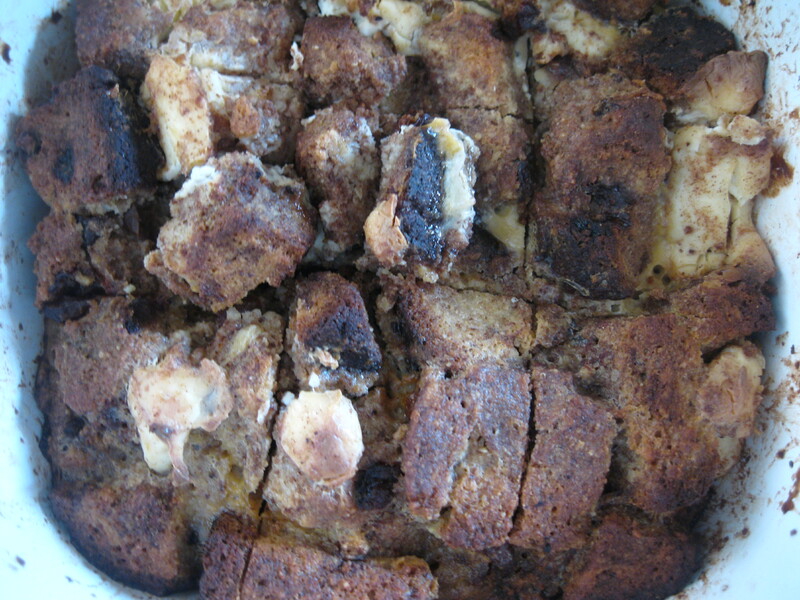 Using a spoon, fold in the chocolate chips and walnuts, if using. Drop dough by rounded tablespoonfuls about three-inches apart on parchment paper-lined baking sheet. 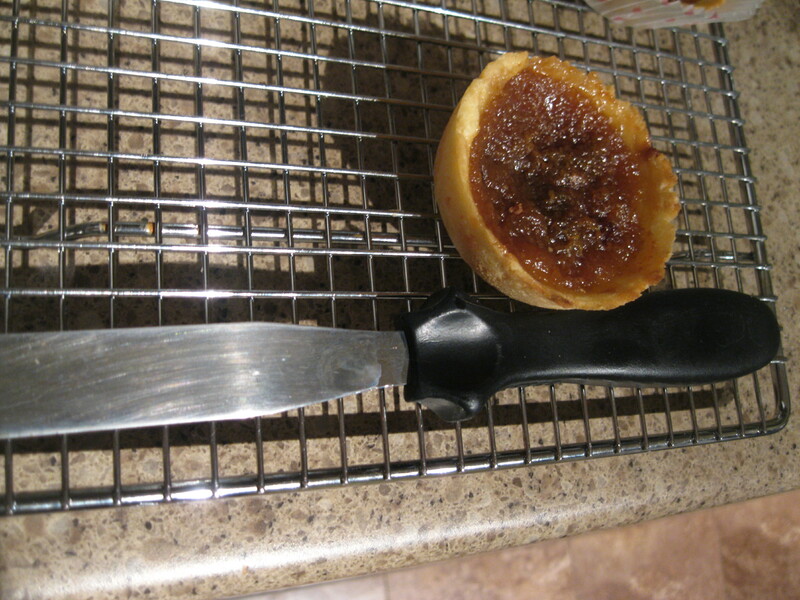 Bake approximately 11-12 minutes, or until golden brown around edges. Allow to cool for at least 10 minutes on the baking sheet. I’m so happy I got to eat a burger last night. Its been many many months of “burger” night being bunless. Some buns I have tried are dry. Most fall apart. It was just better to eat the burg on its own. BUT When we did our road trip to Suzie’s Gluten Free Kitchen we bought some hamburger buns and am I ever glad I did! They are dense, but not heavy. They are a touch on the sweet side. They are NOT dry and on my goodness- they do not fall apart one bit! 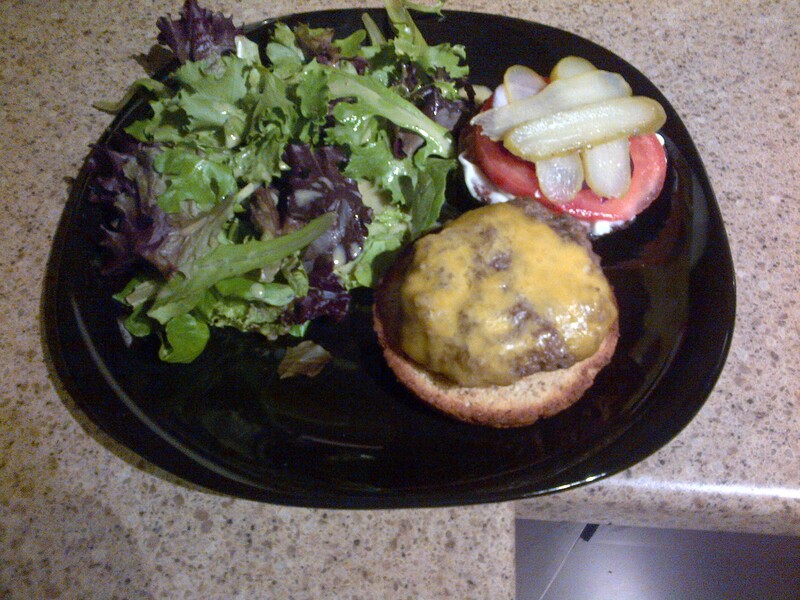 I made cheeseburgers last night and It was the best dinner ever. I’m thinking I’ll have a leftover burger again tonight. 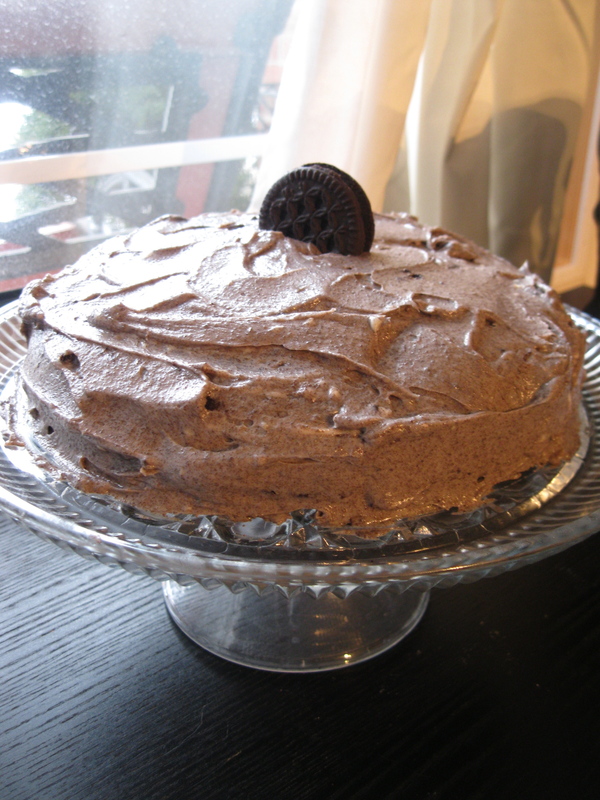 Recipe: Chocolate Cake with Oreo Cream Cheese Frosting! Saturday it was my husbands birthday and we celebrated with his family last night. It was a delicious BBQ steak dinner, potatoes, beans and greek salad. Im so thankful they accommodate my gluten free-ness. To be honest, alot of meat and potatoes types of dinners already just happen to be gluten free- it’s great! I baked a cake for dessert. You may or may not know, that I like to use a good gfree boxed cake mix and then make my own frostings and fillings. 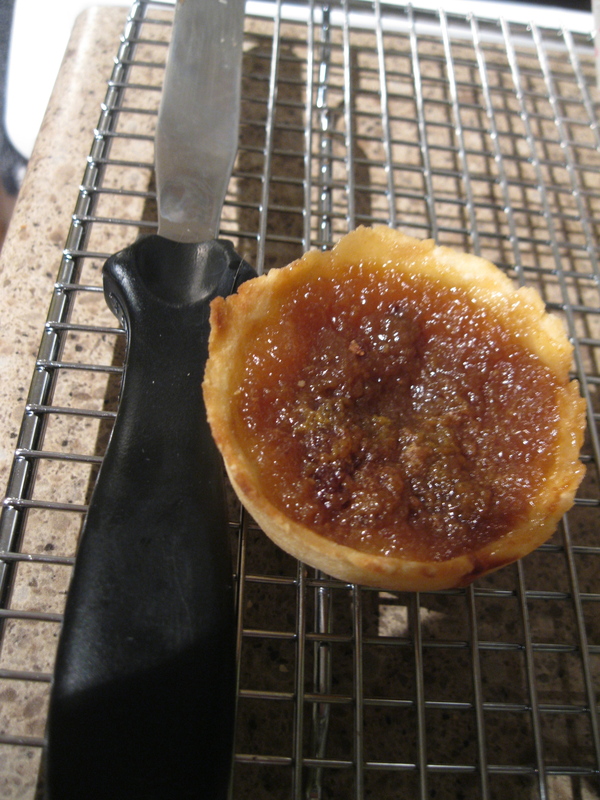 It makes things quick and easy and it still tastes homemade! Beat cream cheese and sugar and vanilla together until fluffy. Add icing sugar 1/4 cup at a time. Then use cream/milk/almond milk to thin out the icing until you are happy with the consistency. Take about half of the Glutino oreo package and blend those up in a food processor until they are grounded up. Then mix that into the frosting and voila! Oreo cream cheese frosting! Beat together the egg and melted butter. Stir the dough together. It will be soft and crumbly. I had a Family Day brunch at my home yesterday.Three of us are gluten free so I needed to make an gluten free version of my usual Oven Baked French Toast.I used Suzies Gluten Free Cinnamon Raisin Bread that we purchased a few weeks ago on our road trip. The bread is denser than a regular bread and doesn’t absorb liquid as easily as its gluten counterpart but it turned out well. The non gluten eaters thought it was really good .I made a simple raspberry sauce to accompany it as well Canadian Maple syrup of course. Bring to a boil and stir. Turn down to medium and simmer until sauce thickens approximately 20 minutes. Serve warm.